The Art Gallery of Ballarat is the oldest and largest regional art gallery in Australia. Established in 1884 as the Ballarat Fine Art Gallery by the citizens of Ballarat, both the building and part of its collection is listed on the Victorian Heritage Register and by the National Trust of Victoria. The gallery was the notable home of the original Eureka Flag (the Gallery has since lent the flag to the Eureka Centre - Home of the Eureka Flag at 102 Stawell Street South, Ballarat) and houses major collections covering the history of Australian art from the early colonial period to the present day. For the first five years of the gallery's life, the Association rented the large supper room of the Ballarat Academy of Music, now Her Majesty's Theatre, which was made available by Sir William Clarke, 1st Baronet. The Association then worked to secure land on the site of the Government Camp and to raise funds for a permanent home for its collection. Much of the energy and the money came from a prominent Ballarat citizen, James Oddie. The current building is the oldest purpose built art gallery building in Australia. Designed by Tappin, Gilbert and Dennehy in the Renaissance Revival architecture style as a bluestone brick and render facade and stone stairway, the foundation stone was laid by Sir William Clarke in 1887 to commemorate Queen Victoria's Golden Jubilee. The new building was opened by Alfred Deakin on Friday 13 June 1890. The gallery is a not-for-profit company limited by guarantee, of which the City of Ballarat is the sole shareholder. It is administered by a board of directors. Louise Tegart is the current Director. 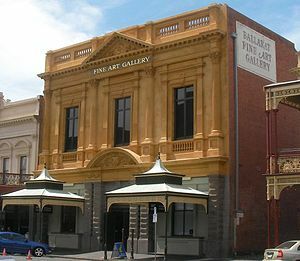 The gallery is supported by the Art Gallery of Ballarat Foundation, which raises funds and receives donations on behalf of the gallery and by the Ballarat Fine Art Gallery Association, an independent organisation which established the gallery in 1884 and gave it to the Ballaarat City Council in 1972. Membership of the Association is open to members of the public and brings with it a range of benefits, including discounts at the gallery shop and cafe and invitations to exhibition openings. A 2001 public appeal raised $2 million for expansion of the gallery. The $7 million extension by H. Troon and designed by Peddle Thorp was completed in 2001 to accommodate the expanding collection of contemporary works, temporary exhibits and gallery functions. In addition, cast iron street gazebos based on the original were reconstructed and reinstated. Entry to the gallery is free, with entry fees applying only to selected special exhibitions. A $1.85 million exterior restoration project began in 2009 and was completed in 2010. The renovation resulted in the reversal of unsympathetic 1950s renovations, including paint being removed from the facade and reopening of the windows. ^ "Ballarat Fine Art Gallery, Victorian Heritage Register (VHR) Number H0680, Heritage Overlay HO76". Victorian Heritage Database. Heritage Victoria. Retrieved 2011-03-27. ^ "Visual Arts". Ballarat History. Retrieved 2007-05-28. ^ 'Ballarat Public Fine Art Gallery', The Argus, 14 June 1890, p. 11.